Turkey welcomed around 39.5 million foreign visitors last year and expects this figure to increase to 50 million by the end of this year. Recalling that congress tourism had experienced stagnation in recent years, Ayık said many congresses were canceled in 2015 and 2016 due to a period of ups and downs. Stressing that congress tourism has started rising again, Ayık continued: "We expect significant dynamism in congress tourism, especially in 2020. We have major infrastructure and our competitive power is very high. We can recover in a short time." Indicating that Turkish Airlines (THY) has played an active role in this area, Ayık stressed that THY has a structure that connects the world. Emphasizing that Turkey has the airline company offering flights to the greatest number of destinations in the world, Ayık added: "One of our weapons in the tourism industry is congress tourism. We can easily organize any kind of international congress in any cities in Turkey, and particularly in Istanbul. We are highly competitive in this area as well." Indicating that Turkey has come to receive a significant share of health tourism, Ayık said the infrastructure of hospitals has considerably improved regarding health tourism. "Our standard of operation and surgery services provided by our hospitals has increased enormously. The scientific achievements and skills of our doctors are at a very good point. We are at a very important point in health tourism as well," he said. Highlighting that systems that provide care in health tourism should be further developed, Ayık remarked: "We believe that if we turn toward certain investments and areas that will respond to the wishes of the elderly in Europe to spend their lives in the temperate climate in Turkey, we will create very serious potential in this area as well. As Turkey and Antalya, we are present in all areas of tourism. We have a strong infrastructure and can use it very easily in any field." Underlining that diversity is important in tourism, Yağcı said the tourism industry has grown based on the "all-inclusive" model. Stressing that Turkish tourism has been very successful in this area, Yağcı continued that Turkey is one of the countries in the world to have implemented this system in the best way. 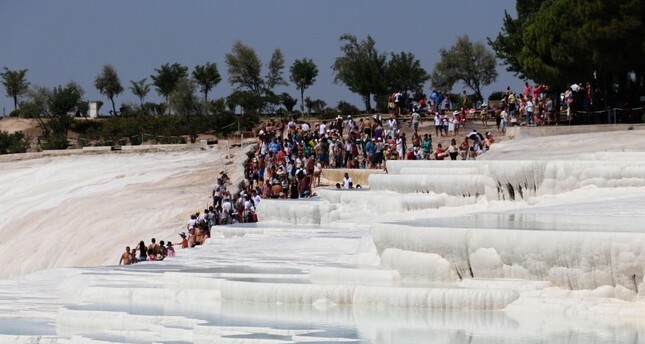 Yağcı further iterated that Turkey has to diversify tourism to achieve its goal of attracting 70 million tourists, adding, "We need to develop culture, sports and health tourism models in addition to sea, sand and sun tourism." He also touched on the conversation he held with former U.S. President Barack Obama last week, saying: "When I mentioned Antalya to Barack Obama, the 44th President of the U.S., who was one of the main speakers at the international tourism summit that I last attended abroad, he told me that 'your golf courses and golf are very nice.' I understood that we had left a mark. The potential of Antalya is very high at this point. We believe that it will offer many different riches in tourism diversity as well. So, we see that Antalya has tourism potential of not 13 million to 14 million tourists but can actually exceed 20 million."